A project funded by the UK ESPA programme (grant number NE-K010239-1). The first field visit to the Mustang District, Nepal took place on 1-8th June 2014. A team consisting of researchers from the Imperial College London, Wageningen University, the Society of Hydrology and Meteorology of Nepal (SOHAM), the national Department and Hydrology and Meteorology (DHM) and Tribhuvan University Kathmandu, sat together with members of the Mustang District Development Committees (DDC) in Jomsom to understand the framework for the governance of and exisiting pressures on local ecosystem services. A follow-up programme involved interactions with members of the village of Lo Manthang in Upper Mustang. Water security for agriculture under climate change was perceived to be a main concern by the villagers as well as the administration, in addition to a decreasing workforce for agriculture as the younger generation seeks tourism-based employment outside their villages. Poverty, however, is partly-alleviated by tourism-based income and a high level of remittance. The visit marked the start of a detailed baseline study to be conducted throughout the year to identify opportunities for participatory knowledge generation to improve water resources governance in the district. Site photos. The first field visit to Naryn District, Kyrgyzstan took place on 7-11th April 2014. A select project team met with Eki Naryn village committees and other influential members of the sub-district. An important outcome of these meetings was the refinement of our understanding of poverty alleviation issues from the village perspective. Poor road access to summer pastures and a non-systematic distribution of irrigation facilities were highlighted by local stakeholders as priorities for improved ecosystem service provision. Both concerns appear to be linked to problems with re-establishing self-governance after the breakdown of centralized governance structures from the Soviet era. The visit also strengthened coordination between the central team, local partners and collaborators (i.e. the University of Central Asia and Mountain Societies Development Support Programme (MSDSP) of the Aga Khan Foundation). Site photos. 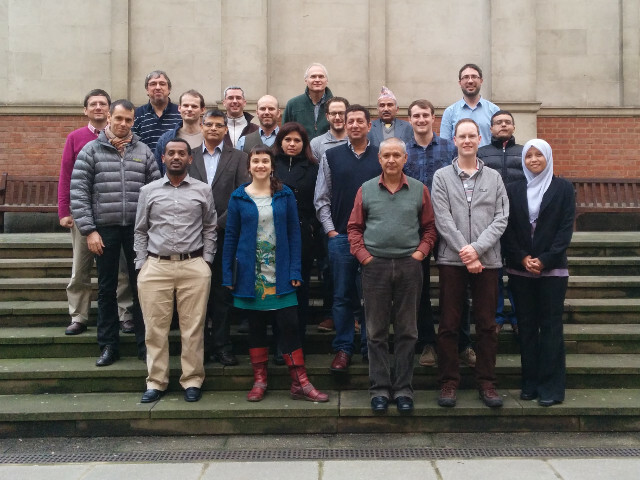 The project kickoff meeting was held on 21-22 January 2014 at Imperial College London, South Kensington Campus. The meeting brought 22 project investigators and partners together for the first time to reapprise the project objectives, exchange ideas on the use of existing research tools, discuss project coordination, and agree on short term commitments. A main outcome of meeting is identifying an immediate need for a common theoretical methodological framework across all four case studies. The communications team of the ESPA programme has created a flyer of our Project Framework Grant "A Virtual Observatory for Ecosystem Services and Poverty Alleviation". Under the title Remote Control, they explain for a broad audience how citizen science and the latest technologies are allowing once isolated mountain communities to monitor fragile local environments and ultimately shape their management. The text is not only a great account of the finished project, but also explains very clearly the core ideas of the new project. Read the flyer. The BBC website just published an article on water supply in the tropical Andes, which features two of our team members: Bert De Bièvre of CONDESAN, who is leading the Jequetepeque case study, and myself. The article explains the value of high-Andean páramo wetlands as vulnerable but crucial water providers. The páramos were a major focus of our previous ESPA project. Similar wetlands also occur in the headwaters of the Jequetepeque. Here the biome is called Jalca, which is a transition between the wetter páramos of the northern Andes, and the drier Puna wetlands in Southern Peru, Bolivia and Chile. The project has been awarded, but has not started yet. This will happen in late 2013. Stay tuned for more information and news.